A Beautiful Ruckus: Parent's Choice Overnight Diapers...Convenient and Affordable! Parent's Choice Overnight Diapers...Convenient and Affordable! I'm so pleased to have been given this sponsored post opportunity with Parent’s Choice Overnight Baby Diapers. Did you know that the average family of quadruplets go through 30,000 diapers before they are potty trained? I know. Crazy, right? With those kind of numbers, we obviously try to save on diapers as much as possible. Every few months, I price diapers on different websites to make sure we are getting the best deal. We've learned to be pretty flexible during the day time since they are changed every few hours. Nighttime is a different story. We routinely pay extra for diapers that are more absorbent. Sleep is a commodity over here, so we really try to keep disruptions to our kids' sleep schedule to a minimum. They simply have better days, when they have had solid sleep the night before (so does Mommy!). Having them wake up because they are soaked through is something that can be avoided, so we do our best not to go there. Not to mention that having a family of six generates enough laundry already. I don't have time to wash extra pajamas, sheets, and mattress pads just because our diapers didn't work! Recently, I was given the opportunity to try Parent's Choice Overnight Baby Diapers from Walmart. I really thought that we had tried just about every brand and type of diaper on the market, but this is one that I didn't even know existed! Walmart has overnight diapers? I'm intrigued! They sent me a package of Parent's Choice Overnight Size 4 Diapers which I promptly put on four little rumps. I'll say this for having quads, they certainly make for a nice test market! 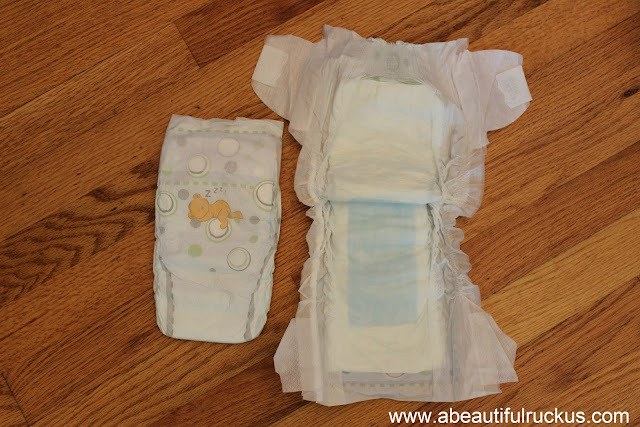 I was very pleasantly surprised with how absorbent the diapers were! Even my boys who have a hard time not leaking stayed perfectly dry. Considering that I've been paying higher prices for name brand overnight diapers up to this point, I'm very thankful to have found not only an affordable option, but also a convenient one! I do most of my grocery shopping at Walmart, so it will be easy to pick up a package of diapers while I'm there. "Night time protection for babies is an important consideration for parents as their little one grows. Ordinary diapers may not have enough absorbent capacity to handle multiple voids over long periods of time with older babies. When wet mornings become the norm, parents start looking for more protection to guard against overnight leaks. Parent’s Choice Overnight Baby Diapers are super absorbent for overnight and long-trip protection. This is an overnight diaper at prices that everyone can afford!" This is a sponsored post written by me on behalf of Parent’s Choice Overnight Baby Diapers. All thoughts and opinions are my own. For more info, please see my disclaimer page. I'll have to give White Cloud diapers another try! I used them on my oldest when she was a baby, but then something about them changed and I didn't like them when my son came along. My youngest is 7 months and tends to leak through Huggies frequently so I'll have to try some of these! We tried the parents choice diapers when ours were younger. Thought we were gonna save some money, however it caused rashes to break out, and had to buy more diaper rash meds. From size 2 on, we went with the Sam's club diapers, which were the cheapest and worked for day and night. I"m glad you found something that worked for your kids little rumps. I know kids have different sensitivities at times. We switched to these as well when our diaper drive diapers ran out (at 18 months) - They were great for us...cost and all! ;) Great Job!! It's always nice to get confirmation from another quad mom! I think I have seen & used almost every brand of diapers. Now I even have one in "goodnighs" for bigger boys overnights, as he doesn't fit in a size 6 anymore. Walmart brand did not work for my munchkins when they were little, they leaked. My other boy who still fits in size 6, is still in diapers overnight & we use the regular ones & they work fine now. I've never seen the overnights in this brand in the stores, but nice to know they exist.